Gingerbread Jam - Two Canning minds - Two different recipes! - Canning Homemade! Home » apples » Ginger » Gingerbread Jam - Two Canning minds - Two different recipes! Gingerbread Jam - Two Canning minds - Two different recipes! Earlier this month one of my new FB friends, Maria, who actively participates on my SB Canning page challenged me to come up with a jam that had the flavor that she loved during the holidays. That flavor was gingerbread. Now being a long time lover of making gingerbread houses, gingerbread cookies, and gingerbread pumpkin bread I instantly had an idea of the ingredients needed and took that challenge. I did a small batch and presented it for her to try. I thought the flavors were, as they say spot on, and on a scale of simple to complex, this was easy even for the beginner. Maria then went into action and create her version which has many layers of flavor and the amount of different ingredients and spices gave hers a very gourmet feel and flavor. A bit more complex for a beginning canner, but at our canning group today the verdict was in. I wanted to make sure that I didn't cloud the group by telling them about the challenge but had them do Maria's recipe as part of their extravaganza today. Once the recipe was complete I pulled out the jar I had of my recipe for them to try. They thought they were tasting what the end result would be that was in the pot, so I had to explain. Here are the two recipes, mine now converted to a full batch, for you to try and decide for yourself. I don't want to cloud your judgement by telling you which they liked best. If you get a chance to make both, please comment below on which you like! Enjoy! Cook down apples for 20 minutes in a stainless steel pot till soft adding 1/2 cup water(or apple juice) so the apples don't burn. Add all the rest of the ingredients and continue to cook, mashing the apples, and creating a smooth consistency. You can use an immersion blender to get the texture you want. Ladle the recipe into a 5 sterilize half pint jar leaving 1/4" headspace. Remove air, wipe rims, and add hot lids/rings. Water bath for 10 minutes once the water has come back to a full boil. SB Canning group jars of Maria's recipe! Wash and quarter the apples. Do not peel the apples because you want the natural pectin in the peels! Cut out the cores. Use your food processor and shred the apples in batches. Add the food proceeder bowl fills, dump the shredded apples into a large Dutch oven. (I use my Le Crueset one.) 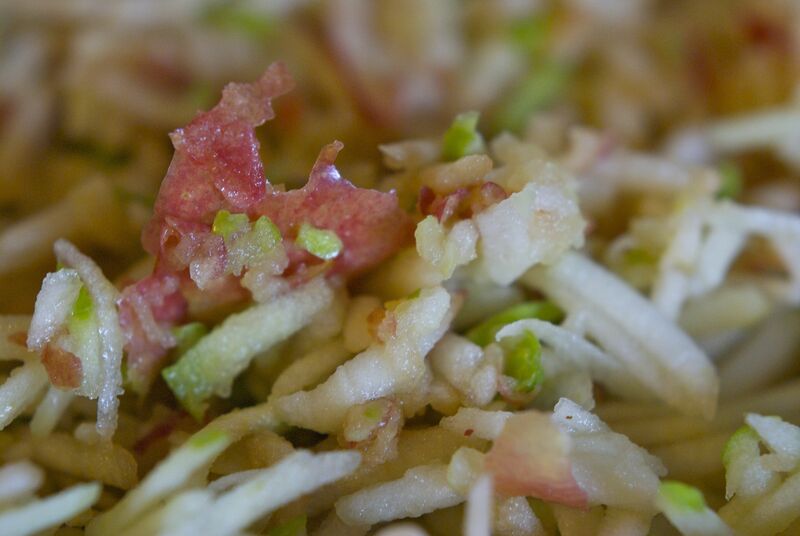 As you add the shredded apples, toss them with about 1 cup of apple cider and 1/2 cup of bottled lemon juice. And do not worry if it seems like you are over filling the pan. The apple shreds will cook down. Add 4 to 5 ginger coins at this point and 2 cinnamon sticks. You do not need to peel the ginger. I cut about a 3 inch piece of ginger and than sliced it lengthwise. Cover the shredded apples and cook over medium heat until they start to cook down. This can take anywhere from 15 minutes to 30 minutes. I found it took about 30 minutes over medium heat on my stove. The apples will release a lot of juice and you really do want them to start to dissolve and cook down. After the apples have started to cook down, start adding the sweeteners. I added a total of 1 cup of molasses in 1/2 cup increments. I allowed the mixture to come back to a simmer before the second half cup. I combined all of my spices and added them at once. Between each addition, bring the mixture back up to a simmer. I adding another 3/4 of a cup of white sugar after the spices. Check your apples for sweetness after adding the molasses. By using the Granny Smiths, I knew my apples would need a bit more sugar. I wanted the jam sweet but with a touch of tartness to it. I would not add more than 1 cup of sugar total. Cook the apple mixture down until it is jammy. Or you can either use an immersion blender or transfer half of the mixture to a blend and puree it until it kind of looks like applesauce. Make sure you pick out any ginger slices and the cinnamon sticks. Bring the mixture back up to a simmer again. Taste test it to make sure you like the flavor and adjust any spices if needed. 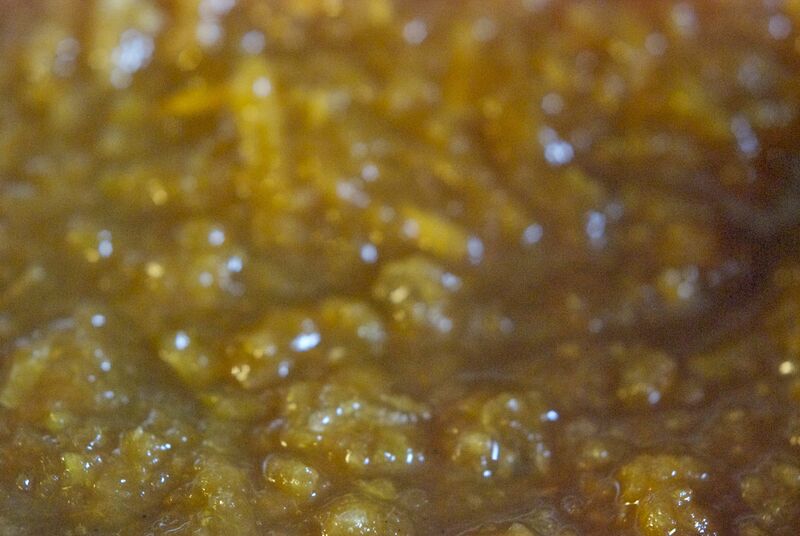 While waiting for the mixture to come back to a simmer, mince about 1/2 cup of crystalized ginger.